In WAR IN HEAVEN, a desperate battle rages in the Horizon Realms, the mystic dimensions that surround Earth. The mages of both the Nine Traditions and the Technocracy are under attack by a mysterious willworker who calls himself Heylel Teomim, the Ascension Warrior. Already, two Horizon Realms have been obliterated, and now others are under attack. But Helyel's most potent threat is a seductive offer that kindles the fires of revolution in younger mages. Only a small band of unlikely allies stands against the Ascension Warrior. If they fail, mankind is doomed. For though Teomim may promise a bright new dawn, his triumph means an eternity of endless night! 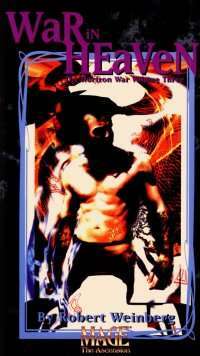 WAR IN HEAVEN is the final novel of the Horizon War trilogy, based on the best-selling games. MAGE:THE ASCENSION and VAMPIRE: THE MASQUERADE. Author Robert Weinberg is also the author of the popular Masquerade of the Red Death trilogy.